The first chapter of this biography begins with a jolt. It opens a month after the main protagonist’s death, with four men gathered around his corpse: his son, his brother, his brother in law and a surgeon. The surgeon cut across the abdomen to replicate a caesarean scar, and Robert Baldwin’s final wish was complete. His wife had died from long-term complications of a caesarean twenty-three years earlier, and Robert Baldwin was now to meet her in heaven bearing the same scar. This opening chapter sets the tone for this biography, which seeks to unite the personal and emotional with the political. Australian readers are probably not familiar with Robert Baldwin, who is lauded as one of the founding fathers of self-government and who, along with Louis-Hippolyte La Fontaine, headed the Reform party in joint Anglo-Canadian governments in Canada between 1836 and 1851 . In Australia, with an overwhelmingly British 19th century population, we are not particularly alert to the nuances of an Upper Canadian politician championing the political equality of the French Lower Canadian province. It was a luxury of mono-culturalism that Canada did not share. Conversely, our own historiographical emphasis on self-government (in, for example Peter Cochrane’s Colonial Ambition) tends to see Canada as an example to emulate as a more constitutionally-advanced sibling, rather than a fellow colony going through much the same battles with the Colonial Office within the same time frame. Robert Baldwin was born in Upper Canada in 1804. His father, Dr. William Warren Baldwin was one of those multi-talented colonial gentlemen who combined a career as medical doctor, school teacher, attorney and politician. W.W. Baldwin was wealthy, forthright and dominant, and Robert was very much in his father’s shadow. He was admitted to the bar and was eventually elected to the Assembly, but he was no orator, often speaking in barely a whisper. He married his cousin Eliza, initially against the wishes of his family, and was heart-broken when she died nine years later. Even though he had chafed against his father as a son, he became very much like him with his own children: critical, cold and domineering. The author, Michael Cross, keeps the emphasis strongly on the psychological and emotional aspects of Robert’s personality. He was a son overwhelmed by the dominant presence of his father; he was prone to depression; he loved deeply and mourned obsessively. Each chapter begins with an italicized and imagined epigraph that counts down the years since Eliza’s death. I can see what Cross is doing here, chapter after chapter, (using Eliza as a touchstone; using Eliza’s death as a tethering-point to the chronology) but it does become rather contrived and mawkish. He makes a good case for this extended grieving for Eliza being a bedrock emotion, fundamental to Baldwin’s personality, by keeping it running throughout the narrative, rather than consigning it to an early chapter and not referring to it again. But I think I would have appreciated a widening of context here. To our eyes his obsession with Eliza’s death seems morbid and bordering on phobic. Was it? I’ve been aware of similar, disabling, obsessive grief expressed by fathers in World War I- was that a new phenomenon or was there an older tradition of overwhelming masculine grief? Was Baldwin’s grief another (albeit earlier) version of that exemplified by Queen Victoria in 1861? Or was it aberrant even at the time? 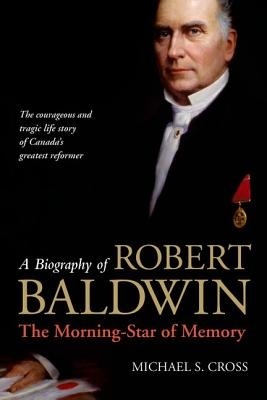 Alongside this ongoing drum-beat of Baldwin’s emotional and psychological state, Cross writes a political biography that traverses many of the big issues of 19th century Canadian history: the 1837 Rebellion, the Durham report, the Montreal Riots of 1849, Irish immigration after the famine and the rise of the Clear Grits. I must admit that most of my reading about Upper Canada has petered out at 1841 with the Act of Union that combined largely- English Upper Canada with largely-French Lower Canada, but I was able to follow the political narrative fairly easily (if uncritically). As an Australian historian, I’m interested that in the lead up to responsible government, Baldwin was so comfortable with what we would call party politics. In Australia at the time, there was still an aversion to ‘party’ as being something disreputable and compromising. I have the advantage, I suppose, of familiarity with both Canadian and Australian history of the time that enables me to detect the empire-wide issues that each government had to grapple with. I found myself surprised that Canada was not, as I had believed, constitutionally streets ahead of New South Wales, which still felt itself hampered by its ‘penal colony’ origins. Instead, politicians in both colonies were tussling with the same Colonial Office personnel who had far more of an empire-wide perspective than can be detected when dealing with one colony alone. I came across Robert Baldwin in my own work through his friendship with my research interest, John Walpole Willis. Cross does not spend a great deal of time on the 1820s, which preceded Baldwin’s election to the Assembly, although Willis’ dismissal became a rallying cause to the reform-party dominated government in the early 1830s. The chronological weaving of this book is interesting and unconventional, with the 1837 Rebellion dealt with rather cursorily at first, but referred to several times in retrospect in later chapters. Willis did not appear to make many firm friends in his life. In Upper Canada, his main friendships seemed to be with John Galt and Robert Baldwin, although Willis tended to downplay his social connection with Baldwin later. Although of a similar social background and education to the ‘Family Compact’ elite, Robert’s politics put him firmly in the Reform camp, and his actions as a barrister in Willis’ courtroom during his brief tenure in Upper Canada, meant that they were both oriented towards the same political direction. I was interested to see whether there was a similarity in political beliefs between the two men beyond the convenience of a common cause at the time. There probably was. Although Baldwin was staunchly in favour of responsible government, and devoted his whole political career to its attainment, he was no democrat. He was firmly committed to British institutions and declared that he hoped to die a British subject (p. 314). Like many of the British reform politicians who had supported the 1832 Reform Bill, he found that his Upper Canadian colleagues were not content to stop at responsible government, but wanted to push further. He wanted change, but not rapid change; he wanted popular participation but not democracy, and he wanted to preserve the best of the gentry-dominated past (p. 284). I find myself indulging in a flight of–‘if history’. If Willis had stayed in Upper Canada, would he have gone on to voice many of the political opinions that Baldwin later did? I suspect that he would have. There’s much ado in Melbourne at the moment about the Winter Masterpieces Exhibition at the National Gallery of Victoria, featuring over 100 works from the Museo de Prado Museum in Spain. We decided to let the hype subside somewhat, and turned our attention northwards to the Bendigo Art Gallery which has its own exhibition of internationally-sourced paintings on at the moment. The exhibition is called “Genius & Ambition”, featuring paintings from the Royal Academy of Arts in London between 1768-1918 and it is on until 9th June 2014. It’s in the art galleries of Victoria that you realize the huge cultural legacy of the gold rush, most particularly in the regional galleries of Ballarat and Bendigo. The Bendigo gallery was founded in 1887 (Queen Victoria’s 50th jubilee) when it took over a polychrome red-and-cream brick building originally occupied by the Bendigo Volunteer Rifles brigade. 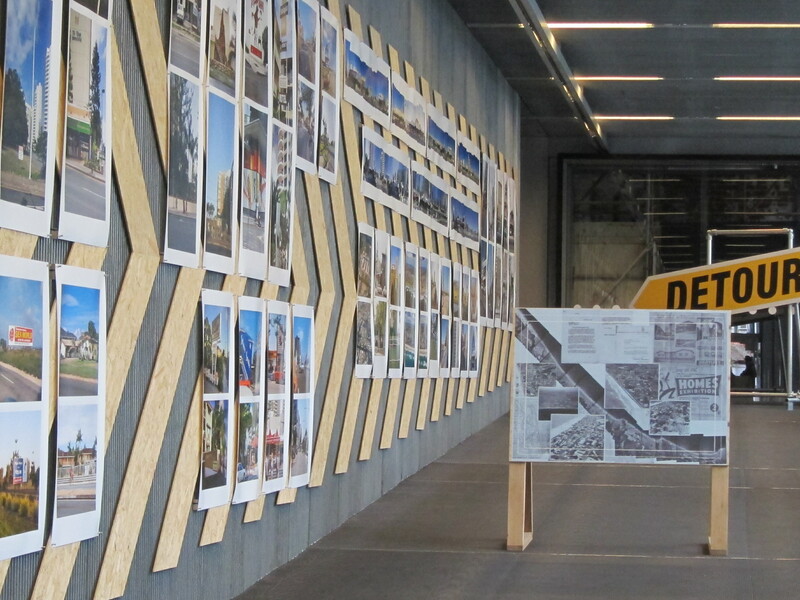 Other galleries were added to it over time, with a large addition to the rear. For this exhibition, tickets were sold from the grand Capital building next door. It was previously the Masonic Temple- designed as “one of the grandest Masonic Temples in the colony”. I’m sure that it would have been. 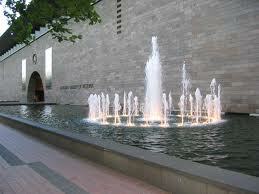 The very grand Capital centre that abuts the art gallery. It was the former Masonic Temple. I must confess that I wasn’t particularly clear on what the Royal Academy was. I’d seen ‘R.A.’ after the names of noted painters, and I know that ‘exhibited at the Royal Academy’ was a claim to distinction amongst Australian painters craving international recognition. From this exhibition, I learned that the academy was started by King George III in 1768, with Joshua Reynolds as its first president. There could only be 40 members at any one time, with another 40 associate members. In a large painting of the founding 40 members you can just see two women, suitably hidden away behind a chair at the rear of the crowd of artistic luminaries. Still- they were there. The Academy included a training school and as one might expect in such an environment where there would be a certain amount of patronage and networking, there were several paintings of the members themselves and the artistic scholars going about their work (including one purporting to show the young William Blake in class). It was only once I started looking at the paintings that the wide scope of the time period 1768-1918 came clear to me. It’s a very clear expression of Britishness over that period. The exhibition, over several rooms, was roughly chronological, and you could see the influences of Impressionism and the Pre-Raphaelites as these artists became accepted into the Academy. One section featured reference books from the R.A. library which influenced the technical skills in art (e.g. photographs of a horse galloping- the first time that galloping could be broken down into discrete time-stop motion; or a colour wheel). While interesting, I felt this part was a bit unnecessary because it deflected attention from the works themselves. 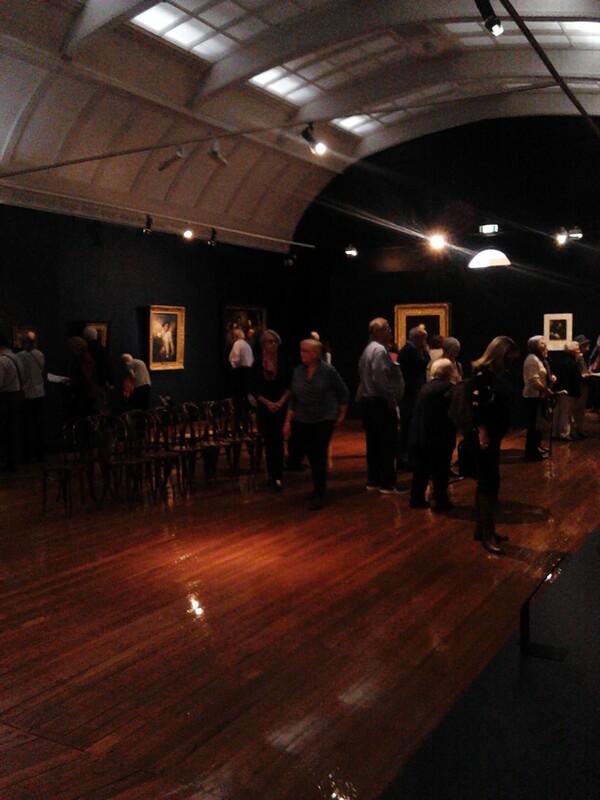 The final room was turned over to Australian artists who travelled to London where they either attended the R.A. as students, or showed their works in the frequent R.A. exhibitions. There was a limit of three works by any one artist in any one exhibition, and several Australian artists had works accepted over a number of years. There were several women painters that I had not been aware of. 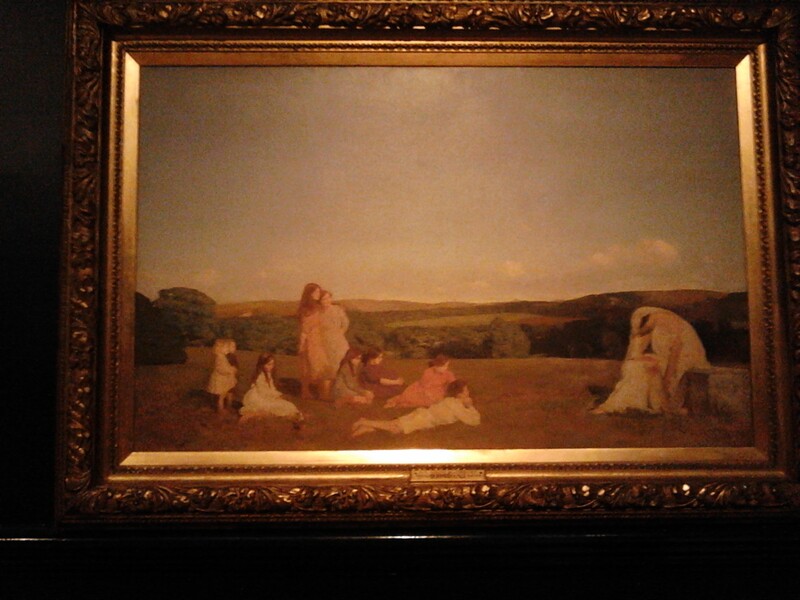 I am nearly always struck by one or two paintings, and in this case it was Charles Sims’ Clio and the Children. Not so much for the painting itself, which is rather ordinary (in fact, looking at the odd proportions of the children very ordinary), but for the back-story. 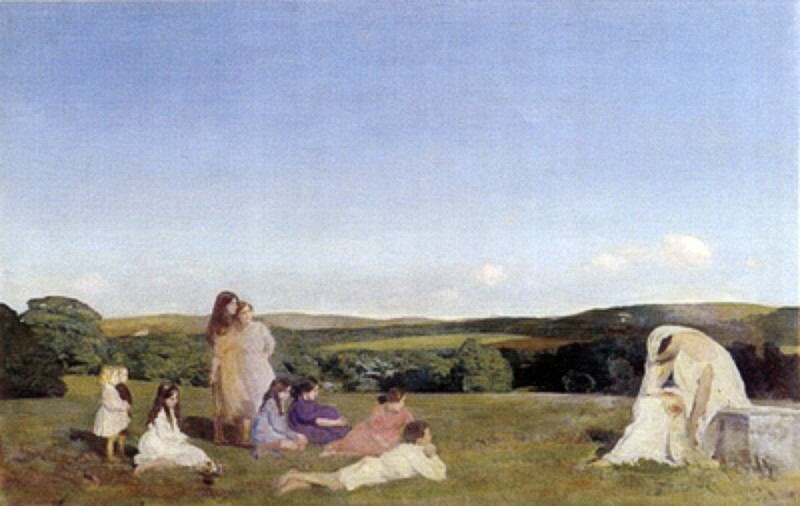 Charles Sims often painted outdoor scenes showing women and children, and this 1913 painting of a group of children listening to Clio, the goddess of History reading from a scroll is typical of his work. In 1914 his eldest son was killed in battle. 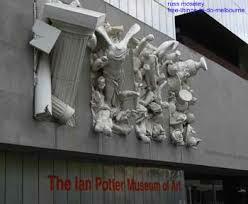 Sims returned to the painting and daubed the scroll in blood, which changes the whole meaning of the painting. The other painting was ‘After Velacquez’ by Sir John Everett Millais, who was the youngest student ever enrolled at the Royal Academy school at the age of eleven (although he was not admitted to the RA itself until the age of 34). It references Valacquez, but the sleeves in particular and the red hair of the young sitter are the mark of the Pre-Raphaelites. I have to say, though, that this was a particularly dim exhibition. Perhaps it was a condition of loan, but you could barely see some of the paintings in the Stygian gloom, let alone read the panels. I used one of their Large Print booklets, and judging by their popularity amongst the patrons – not all of whom needed Large Print – you really do need to question the size of the font and the colouring of text panels. You need to be about 30 cm away to be able to even decipher the text, then push through the crowd also wanting to read in order to actually see the painting. I don’t really like using headphones at an exhibition if I’m there with someone else because it makes it such a solitary experience. You comment on a painting then realize that you’re talking to yourself because your companion can’t hear you. If you’re the one using headphones, by the time you realize you’re being spoken to, and mutter “Eh, what? Hold on!” (usually in an inappropriately loud voice) as you fumble around with the controls on the audio device, the comment seems so banal that it was barely worth making. Lunch, a stroll up and down the expensive antique shops along View Street, a visit to the Op shop for less expensive old things, then off to Maldon for a coffee once our lunch had gone down. I was very disappointed to learn that the National Trust has sold the Penny School. Shame on them. Some books seem to shift shape while you’re reading them. Sometimes it really is the book that changes direction during its narrative, but other times it’s because you, as a reader, adjust your concept of what it is you’re reading as you go along. 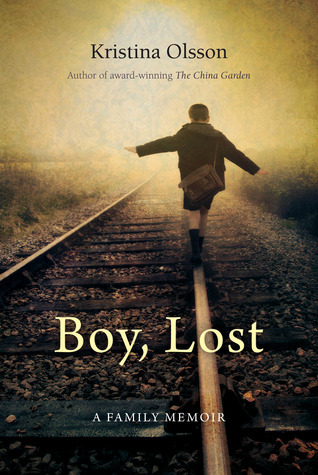 Boy, Lost was such a book for me. To be honest, I started reading it thinking that it was a fiction book narrated in the first-person, beautifully told, with the crystalline clarity of authenticity. It was only when some facts seemed so concrete and so banal that I started to wonder if it was non-fiction instead. I turned to the back cover, and sure enough- there it was, ‘Non-fiction/Memoir’. And I obviously don’t look hard enough at the front covers of the books I read, because under the title, there it is again: “A Family Memoir”. At the end of the book, Olsson explains how she came to write this book that she felt was not hers, initially, to write. It is her mother’s story, and her brother’s, and yet even untold it affected the whole family. 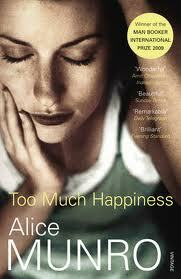 In this book she is piecing it together and telling it for her family, with their blessing and at their request. In the closing pages she broadens her perspective beyond her family’s story to reflect on the historical and sociological phenomenon of ‘lost’ and stolen children among unmarried mothers and aboriginal mothers more generally. 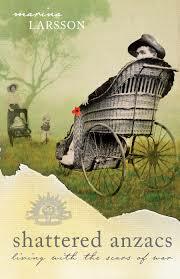 Olsson’s mother Yvonne marries young- too young- to Michael, a Greek post-war immigrant. He takes her to far-north Queensland, where the veneer of a sensual, confident older man soon fractures to reveal a cruel, rigid and controlling man. In 1950 after enduring three years of marriage to him, the pregnant Yvonne takes her infant son and flees on the train. But Michael appears, takes their son from her arms, snarls a warning to her and leaves. Yvonne will not see her son for another forty years. She remarries; she has other children. She was deflected from taking action by people who told her that her infant son would have a better life with his father than he would with her, a single-mother and waitress. He would live like a little Greek prince, they said, basking in the glory of being a Greek son during the 1950s. He didn’t. Instead, Peter had a spare, sad life. He was too young to remember his mother, but the past had gripped and confounded him and stalked his dreams, as well. I very much enjoyed this book, even though it utilizes two of the stylistic techniques that I usually dislike: very short chapters and use of the present tense. The stories of Yvonne and Peter are alternated, moving forward chronologically, but not touching each other for much of the book. Interwoven between their two stories are Olsson’s own reflections on the childhoods of Sharon, her older half- sister (full sister to Peter) and several brothers, as they circle warily this fracture in their family. Each section is only a few pages in length. I usually dislike such a ruptured narrative, seeing it as a cop-out from having to tie the narrative together in a logical and pragmatic sense, but in this book it works. There are abrupt stops, loose ends and silences throughout all their stories, and the structure reflects that well. The present tense is perhaps more problematic. In her ANZLitLovers blog Lisa Hill recently referenced some observations by the writer Dorothy Johnston about the ubiquitous use of present tense in recently-published books. I acknowledge that the present tense brings a sense of immediacy and contingency to the writing, but I find it rather suffocating and anxiety-producing. 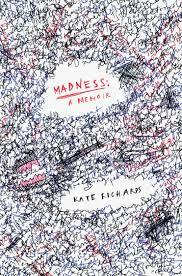 This book IS, however, an anxious, hand-wringing book, and I think that the present tense works well here. The author has inserted herself into the narrative the whole way through the book, but in the closing pages she steps into the light completely. She is at pains to answer the question that has tortured both her mother and her brother: why didn’t her mother try harder to get him back? Her mother’s story of the lost – no, taken- child was replicated in the stories of unmarried mothers, not good enough mothers, Aboriginal mothers. I think that she provides as good an answer as can be made: that, in L.P. Hartley’s words, the past was a different country, and they did do things differently then. But that is somewhat of a get-out clause. While recognizing the pressures and constraints that might have caused people to act as they did, she does not downplay the deep sense of loss that exists at the heart of her family. Things and people can be re-located and re-identified, but events have moved on and the past cannot be recaptured. Some losses are never truly found again. 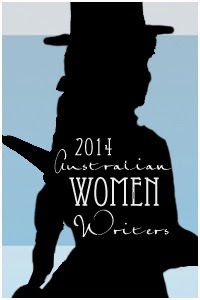 Read because: Australian Women Writers Challenge 2014.